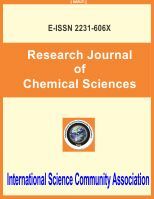 International Science Community Association are publishing an international peer reviewed journal Research Journal of Chemical Sciences. It is the vision of International Science Community Association to publish research papers, research articles, review papers, mini review, case study and short commutations in all areas of human study without financial restriction. Coverage Area: Researches in the field of Agricultural chemistry, Analytical Chemistry, Astrochemistry, Atmospheric Chemistry, Biochemistry, Bioinorganic Chemistry, Bio-organic Chemistry, Biochemical Engineering, Chemistry, Chemical Engineering, Cluster Chemistry, Combinatorial Chemistry, Chemical Modeling, Chemical Processing, Chemical Thermodynamics, Colloid Chemistry, Drug Chemistry, Civil Engineering, Energy, Electrochemistry, Environmental Chemistry, Environmental Law, Environmental Policy and Management, Forensic Chemistry, Food Chemistry, Fuel Chemistry, Geochemistry, Green Chemistry, Hydrometallurgy, Inorganic Chemistry, Industrial Chemistry, Kinetics, Macromolecular Chemistry, Medicinal Chemistry, Marine Chemistry, Material Chemistry, Nanochemistry, Nuclear Chemistry, Organic Chemistry, Polymer Chemistry, Petroleum Chemistry, Photochemistry, Physical Chemistry, Polymer Chemistry, Pollution and its Prevention, Pharmaceutical Chemistry, Solid State Chemistry, Spectroscopy, Soil Chemistry, Separation and Purification Chemistry, Sonochemistry, Surface Chemistry, Water Chemistry, etc.